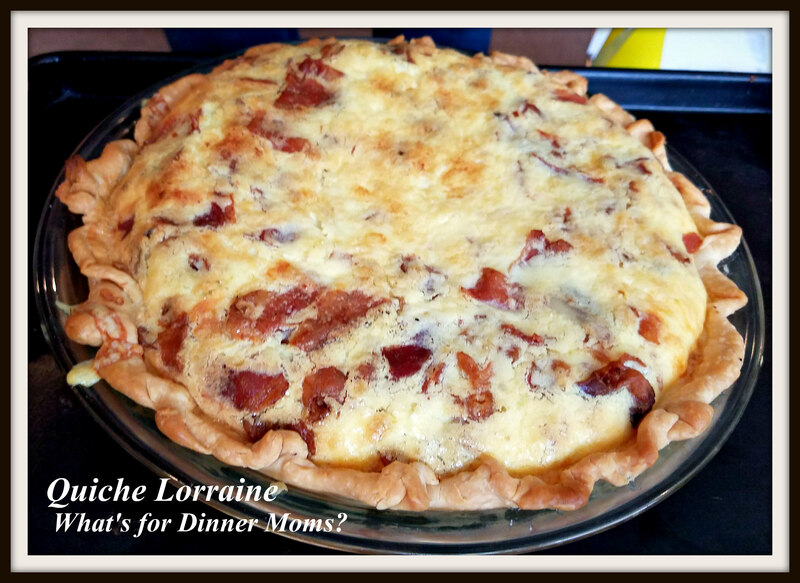 Quiche Lorraine – What's for Dinner Moms? Yesterday afternoon while I was in a meeting gas prices rose $.24 to $3.09 a gallon. I was shocked. I knew it was coming but the reality felt like a gut punch. I drive a couple hundred miles a week. It cuts into our budget. So, even less dinners out now. 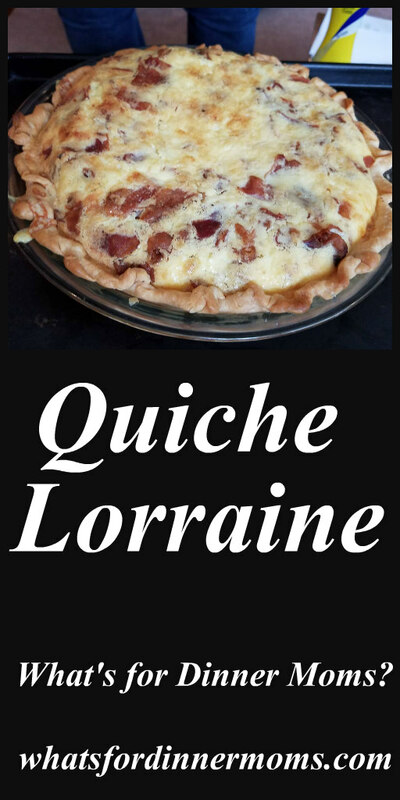 Quiche Lorraine is one of my most favorite dishes any time of day. For brunch, breakfast, or dinner I love the flavors and how simple it is to make and reheat. 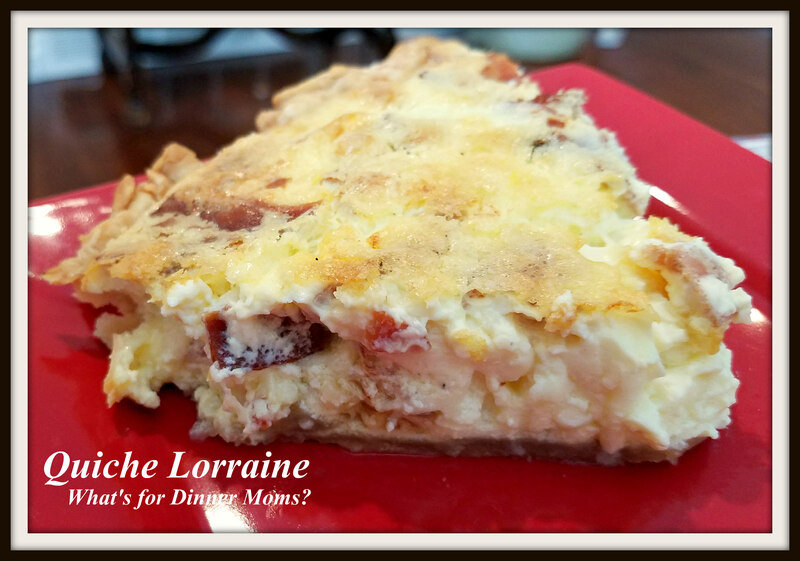 I learned that this Quiche (or egg pie as my family calls it) is from the Lorraine area of France. It has pork (usually larder but I used bacon) and onions. This was so good. It has been ages since I made a Quiche. Want to make it a bit faster use a store-bought crust rather than making your own but as always a homemade crust will probably taste better. I could eat this every day, all day as my one and only food. I love it that much except it is so rich I would constantly be sick. We made four Quiche. One large one and then three little ones for the kids, without onions. I prefer the added depth of flavor from the onions but if you don’t like them you can leave them out. Serve this with a spinach or green side salad and you have a complete meal. Place pie crust in 9″ pan. Crimp and trim as necessary. Sprinkle bacon, cheese, and onion over the bottom of the pie crust. Whisk together eggs, half and half, salt, and black pepper. Pour over ingredients in pie crust. Reduce temperature to 300 degrees and continue to bake for 30 minutes. When knife inserted in center comes out clean Quiche is done. Remove from oven and allow to sit for 10 minutes before serving. Please visit Hawaii and our families will have Quiche together! Oh, yummy! i’ll try your recipe! I also love this dish, Marci. Nice recipe.